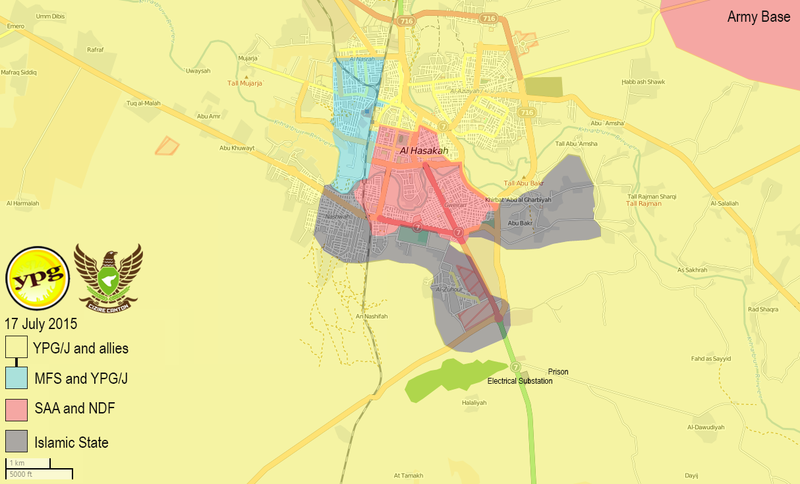 The Battle of Al-Hasakah (June–August 2015) started as an offensive launched in the Al-Hasakah Governorate during the Syrian Civil War, in which the Islamic State of Iraq and the Levant (ISIL or ISIS) attempted to capture the city of Al-Hasakah, which was divided into two areas held separately by the Syrian Armed Forces and the Kurdish YPG. On 17 July, YPG-led forces captured all of the roads and villages surrounding Al-Hasakah, fully besieging the ISIL militants remaining inside of the city. On 28 July, YPG-led forces and the Syrian Army expelled ISIL from most of Al-Hasakah, with two ISIL pockets persisting near the Al-Zuhour District and the southern entrance. On 1 August, the city was fully cleared of ISIL fighters. On 30 May 2015, after ISIL forces suffered a collapse in the western Al-Hasakah province, they launched an offensive on the Syrian government-held portion of Al-Hasakah city. Although the Kurdish YPG initially stayed out of the conflict, they eventually joined the conflict on 5 June, after ISIL reached the southern gate of the city, after a decision that the YPG would be recognized as a primary combatant force in the city. On 8 June 2015, ISIL was pushed back from Al-Hasakah city, and Syrian Army forces were able to establish a 12 kilometer (7.46 mi) buffer zone around the southern portion of Al-Hasakah city. On 23 June, three or four ISIL suicide bombers targeted a Syrian Army security compound, a military checkpoint near a children's hospital, and a YPG police station in the Kurdish-held part of the city. Ten Syrian government soldiers were killed in the attacks. Two days later, ISIL began an assault on the Syrian government-held parts of the city, after detonating an VBIED near a checkpoint at the southern entrance, seizing the al-Nashwa and al-Shari’ah neighborhoods, the children’s hospital, and the education college. Later, the Syrian Army brought in reinforcements in an attempt to counter the offensive, while ISIL detonated a second suicide car bomb. On 26 June, ISIL managed to enter the southeastern parts of the city, while at least 20 Syrian Army soldiers were killed after ISIL detonated two VBIEDs at the criminal security building, resulting in the destruction of large parts of it. On the same day, ISIL forces launched an assault on Syrian government-held areas to the east of the Kurdish held Abd al-Aziz Mountains, capturing territory from the village of Abyad to the south of Al-Harmalah, west of Al-Hasakah city. On 27 June, the YPG was engaged in the battle for Al-Hasakah city, as it supported local Syrian government forces near al-Villat al-Homr, on the outskirts of the Ghuweran neighborhood. Despite Republican Guard reinforcements, ISIL advanced further into the city on that day. The Syrian Army launched a counterattack, after 400 Republican Guard soldiers from Deir Ezzor were deployed to Al-Hasakah, while the Asayish declared a curfew over the city. The Syrian Army reportedly recaptured the Al-Liliyah district and the eastern corridor of the Al-Nishwa District. On 28 June, ISIL made new gains, capturing the Ghuweran stadium, and the Aziziya and Al-Ghazal Districts. On the following day, Syrian government forces advanced towards the al-Nashwa District, after calling in new reinforcements, and reportedly recaptured the Ghuweran District later on that day. At least 12 Syrian Army soldiers were killed by three suicide bombers, while 9 ISIL militants were killed. The Syrian Kurdish People’s Protection Units (YPG) militia claimed ISIS had fired “makeshift chemical projectiles” containing poison gas at areas in the city of Al-Hasakah, and at YPG positions south of the town of Tel Brak to the northeast of Hasakah city. On 29 June, Syrian state TV claimed that Syrian government troops had recaptured the al-Nashwa district, while the SOHR confirmed they managed to seize parts of al-Nashwa but that fighting around the area continued. A Damascus security source also confirmed fighting continued in the district. Later on that day, the pro-Syrian government Al Masdar News reported that the Syrian Army recaptured the Ghuweran Stadium. Over the next two days, the Syrian Army managed to recapture most of the areas seized by the ISIL militants. In addition, the YPG reportedly expelled ISIL from al-Aziziyah and took control of the neighbourhood and the nearby villages of Maruf and Hamra. On 1 July, the Syrian Army brought in new reinforcements, while two VBIEDs were detonated inside the city, as ISIL renewed its attack on the Ghuweran district. The next day, ISIL regained ground in a city neighborhood. On 3 July, 11 Syrian Army soldiers were killed and wounded by an ISIL suicide bomber in the city. On the same day, ISIL advanced to the Khabur River in southwestern Al-Hasakah city, reaching the Kurdish and Assyrian-held part of northern Al-Hasakah. By then, ISIL had deployed over 4,500 militants into Al-Hasakah city. By 5 July, YPG forces stationed to the east of the Abd al-Aziz Mountains launched an offensive eastward, capturing multiple villages that ISIL had captured from Syrian Army forces, in an attempt to sever an ISIL supply line to Al-Hasakah city. The US-led Coalition also conducted two airstrikes near the highway, in support of the YPG advance. On 8 July, the Syrian Army units reportedly established full control over the al-Lailiyeh neighborhood in Al-Hasaka city. On 10 July, ISIL captured the Faculty of Economics, on the southern outskirts of the city, but part of it was recaptured by the Syrian Army later in the day. The Syrian Army also reportedly captured the southeastern part of the Al-Nishwa District. On 10 July, ISIL militants captured the military housing to the east of the Al-Zuhour neighborhood, fully besieging the Syrian Army forces in the juvenile prison and the power plant to the south of Al-Hasakah city. Around the same time, YPG forces to the south of Al-Harmalah had advanced eastward to the Abyad Bridge, capturing it, and severing a section of an ISIL supply route, to the south of Al-Hasakah's Al-Nishwa District. On 13 July, ISIL captured the Al-Ahdath Prison, in the southern countryside of the city, after besieging it for one week. 23 NDF and SAA soldiers were killed and 11 missing during a breakout attempt, while 37 SAA soldiers managed to reach Syrian government lines. On 14 July, the Syrian Army announced it had concluded the first phase of military operations inside the provincial capital of Al-Hasakah, and had now entered the second phase. The first phase consisted of forestalling ISIL’s progress in Al-Hasakah city. The goal of the second phase was to recapture the west district of the Al-Nishwa Quarter, along with the remaining territory in the Al-Zuhour Quarter under ISIL’s control (i.e. the Panorama Roundabout). The goal of the third and final phase was to recapture the villages surrounding Al-Hasakah City, in order to build another buffer zone to prevent the encroaching combatants of ISIL from re-entering. On 17 July, YPG captured the Al-Ahdath Prison as well as a power plant, from ISIL, in an action that effectively encircled the 1,200 remaining ISIL combatants in the city. YPG fighters had also taken control of the villages formerly controlled by the Syrian Army to the west of Al-Hasakah city, leaving the Syrian Army in control of only central Al-Hasakah city. This left ISIL fully besieged in Al-Hasakah city in 2 separate pockets, in the Nashwa, Al-Zuhour, and Abu Bakr neighborhoods, in the south and the southeast of Al-Hasakah city. By 20 July, the Syrian Army also expelled ISIL fighters from the Ghuweran district. On 21 July, SOHR reported that 13 ISIL fighters had been killed in SAAF airstrikes. Simultaneously, YPG reportedly advanced, capturing Al-Watwatiyah and the rural area north of Tal Tanaynir as well as some farms north of Bab Al-Khayr. NDF and Gozarto also gained some territory, capturing three building blocks in the Al-Shari’ah neighborhood. ISIL forces were reportedly now fully besieged inside Al-Hasakah. By 23 July, Kurdish forces and their Syriac allies were largely in control of the city, having recaptured their own areas, as well as areas previously held by the Syrian Government, from ISIL, as well as controlling most of the access points into the city. That day, YPG and allies advanced towards al-Melbiyyeh regiment, as well as taking parts of Western al-Nashweh neighborhood. Meanwhile, government troops also advanced in the Ghwyran neighborhood. At the end of the day, ISIL retreated towards the Shar'iah neighborhood, while the YPG and Syrian government forces made new gains in the city. On 24 July, it was also reported that the ISIL leadership in Al-Shaddadi had abandoned a plan to rescue to besieged ISIL forces in Al-Hasakah city, after two vehicle bomb attacks were stopped by the YPG at Al-Dawudiyah and Al-Salaliah. By 25 July, Kurdish and allied forces had seized the western al-Nashweh neighborhood and reached the outskirts of Shar'iah neighborhood, while also reaching Filastin Street in the city center. Meanwhile, Syrian government forces advanced around the Gweiran Sport City. On 26 July, the SOHR reported that Syrian government forces had managed to isolate the ISIL units in the southern Al-Hasakah city, separating the contingents battling the YPG in western al-Neshwa from the units fighting Syrian government forces in the al-Zuhour neighborhood, in the southern part of Al-Hasakah city. Hundreds of civilian refugees who had previously fled the battle were now reportedly beginning to return to their homes. ISIL control of the city was reduced to 10%, with Syrian government forces controlling 20%, and the Kurdish forces and their allies now expanding their control to most of the city, with them controlling the remaining 70%. Later on that same day, the SOHR reported that ISIL was close to defeat in Al-Hasakah city, with their presence reduced to a pocket of resistance in the neighborhood of al-Zuhour, in southern Al-Hasakah city. The recent days of conflict had left at least 271 ISIL fighters dead. On July 28, it was reported that ISIL had finally been defeated after the YPG and government forces managed to seize al-Zuhour, which killed 31 ISIL fighters. A few remaining ISIL militants were said to be trapped inside the west district of the Al-Nishwa Quarter, with all available supply lines breached and nowhere to escape. Later on 28 July, the Al-Zuhour District was nearly cleared by YPG and Syrian Army forces, resulting in the remaining ISIL militants being pushed to the southern outskirts of the city. On 29 July, the US-led Coalition conducted two airstrikes on ISIL positions near Al-Hasakah city. On 30 July, there were still two ISIL pockets at the southern entrance of the city and in the Al-Zuhour District. The remaining ISIL militants tried to entrench themselves inside buildings near the Youth Housing Camp, but were subjected to further assaults, with 20 fighters killed by YPG forces. The remaining ISIL fighters were thus left with an ultimatum to "surrender or die". Meanwhile, five soldiers were killed and eight others wounded after ISIL launched an attack on the southern part of Hasakah city. By 31 July, Syrian government forces had made further advances against ISIL. By the next day, the number of killed ISIL fighters since 28 July had reached 25. Clashes continued in the southern suburbs until 1 August, and later on that day, the city was reportedly secured from ISIL, after their last stronghold in the al-Zuhor district was captured by SAA/YPG forces. On the same day, the YPG and the SAA released press statements stating that they had fully secured the city from ISIL. The YPG also stated that the nearest ISIL positions to Al-Hasakah city had been pushed back to a distance of 4 kilometres (2.49 mi) from the city suburbs. The battle against ISIL left several districts of Al-Hasakah city in ruins, due to the massive bombings and shelling. On 3 August, Syrian government sources confirmed that the city had been fully cleared of ISIL fighters. The sources also stated that the Syrian government and the YPG had now begun negotiations for redistributing contested territories seized by either side during the battle. Thus far, negotiations had resulted in the Syrian government handing control of a school over to the YPG. On the night of 3 August, YPG-led forces captured farmland from ISIL near the village of Rajman, to the southeast of Al-Hasakah city, in a clearing operation. On 11 August, the US-led Coalition conducted an airstrike on a village east of Al-Hasakah city, blowing up a building that ISIL was using for a meeting, which killed over 50 ISIL militants. On 12 August, ISIL reportedly publicly shot and executed more than 90 of its own members as punishment for escaping the battlefield. ISIL claimed that the fighters' desertion was the main cause of ISIL's loss at the Battle of Al-Hasakah. It was reported on 16 August that ISIL had executed four more of its own fighters, for allegedly collaborating with the CJTF–OIR Coalition. This page was last modified on 25 May 2016, at 12:09.